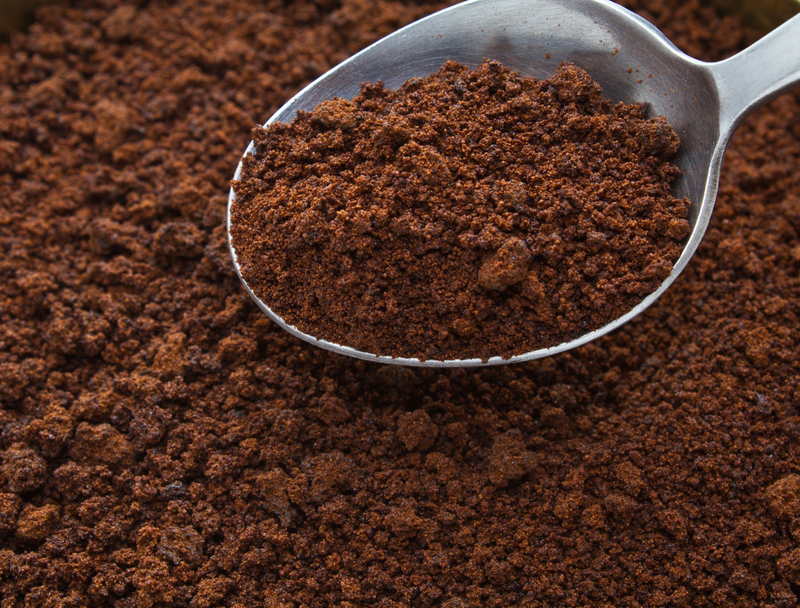 Eat instant coffee for a faster infusion of energy into your system. One of my two main characters, Dr. Zeke Rowe, former intelligence officer-turned paleoanthropologist, does this when he’s in a hurry. Everyone knows we drink coffee for the energy rush. Zeke simplifies it by eliminating the heating, stirring, and sipping. When he introduced this idea somewhere around page 109 of the book, I decided to try it. I shouldn’t have. It is the most awful taste I’ve ever put into my mouth, akin to drinking sour milk. Drink your first cup of coffee in the shower. Zeke does this because he’s a multitasker. He always looks for ways to double up on activities to save time. I like multitasking. I’ve been known to read email while I dry my hair and or brush my teeth, so this, too, I tried it. Too often, I dripped shampoo or soap into the cup, which doesn’t taste good. Wear a sign to warn those around you about your shortcomings or moods. One of my characters threatened this, but didn’t do it. I haven’t tried it yet. If you toss cornmeal across your front doorstep, you’ll know if anyone breaks in. There’s no way to replace that after it’s been smudged. I mean, who carries corn meal with them? Aubrey Maturin is a wonderful character. I’d never heard of him. When I discovered that both of my main characters read all twenty books in the series by Patrick O’Brian, I bought one. This is the ongoing story of a friendship between Captain Aubrey, R.N., and Stephen Maturin, ship’s surgeon and intelligence agent during the Napoleonic Wars. It’s now at the top of my TBR list. 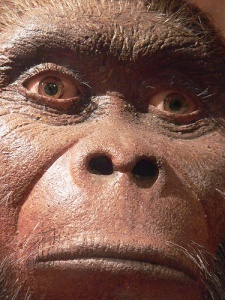 Lessons come from unusual people (in my story’s case, a 1.8 million year old pre-human). Kali, my female main character, learns about life, loyalty, tenacity, and values from one of man’s earliest forebears. It would take a while to explain, so you’ll have to read the book to find out how this happens. I have her picture below. Amazing eyes, aren’t they? Lots of people use a verbal Mobius Strip in their decision making. Let me explain. 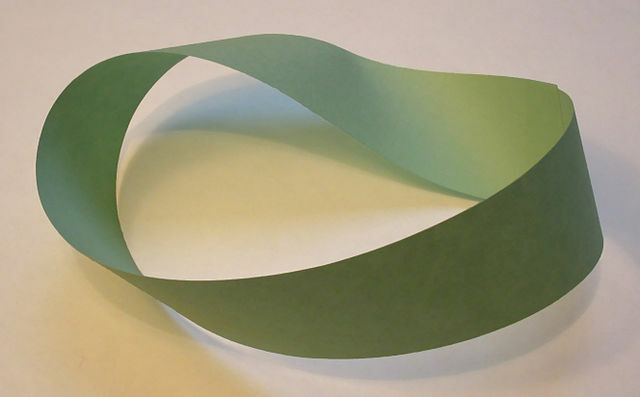 You know what a Mobius Strip is–a strip of paper turn once and attached so that it only has one side. I’m sure you know people who use every argument they hear to support their own opinion until there’s no sense in talking to them anymore. My female main character, Kali, has one of those on her PhD committee. This short list, of course, doesn’t include all the fascinating tidbits I’ve learned in the research process. Those keep me writing. What traits have you adopted from your novel’s characters? ← Finding a publisher isn’t always the end of the story. My characters talk to me like this a lot of the time! It’s enlightening and enjoyable and sometimes frightening to hear what they have to say. But what I’ve found as well is that if I attempt to make them do something which is contrary to their character… they revolt. They refuse to cooperate until I write them as they actually are, instead of how I might want them to be. You have the same problem! I know when I’ve misrepresented them because they are stiff and awkward and make me as reader cringe. Wow! What a fabulous post! You have some pretty interesting characters, and I find it fun to know that you’ve tried drinking coffee in the shower. I can’t do that – it would require having made the coffee in the first place! Please do a similar post! I live in fear of what Zeke and Kali will try next. That coffee was just awful. Quirky eating habits are always good for a bit of insight about what motivates characters and a view to another side of life. I’ll have to think up some strange behaviors for my characters. Of course, Andie does something quite unexpected in The Tree House Mother so maybe she doesn’t need any other habits. And then there’s her mother – ’nuff said.